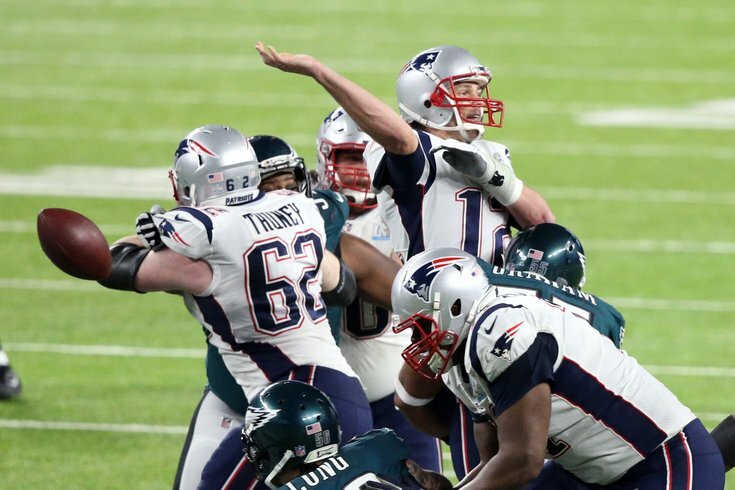 Philadelphia Eagles defensive end Brandon Graham forces New England Patriots quarterback Tom Brady to fumble during the fourth quarter in Super Bowl LII at U.S. Bank Stadium. If the Eagles were going to win a Super Bowl, there was never any way they were going to win it in a "normal" game. Behind a brilliant game from Nick Foles, Doug Pederson and the rest of the Eagles' offense, Philadelphia captured its first Super Bowl title in a 41-33 shootout against the New England Patriots. The Eagles are Super Bowl champions. Savor it, say it to yourself, enjoy it now and for the rest of your life. • The reason most teams lose to New England is that they lose control of the game, either by playing too timid or not taking enough time off the clock when they have possession of the ball. Thanks to Doug Pederson's playcalling, the Eagles did a little bit of both in the second half, mixing up run and pass plays to perfection with the Patriots breathing down their necks. Pederson's knack for picking the right plays at the right times is uncanny. His team had a third-and-one in four-down territory early in the third quarter and easily could have just run a bland run up the middle with one of his power backs. But Pederson used that knowledge against the Patriots and set up a play-action throw down the sideline, extending the series and giving the Eagles a chance to extend their lead once again. It all paid off several plays later when Nick Foles hooked up with Corey Clement for a monster touchdown in the back of the end zone, and one that had to survive the review process at that. Think for a second about this sequence. An undrafted free agent, not too long after making a game-changing play to close the first half, is hauling in a huge touchdown in the second from a backup quarterback only playing because the franchise guy tore his ACL. Later in the game, with New England in the lead and the game on the line, Pederson had to choose between trusting his defense to get a stop and going for it on fourth-and-short on his own end of the field. He chose the latter, and it kept the Eagles' hopes alive. A lot will be written about this game and the implications for the team moving forward, but one thing that is crystal clear after this run to the Super Bowl is how lucky the Eagles are to have Pederson as their head coach. He did a masterful job playcalling and picking apart a defensive legend's team. • While Pederson is the star of this game from my view, it is impossible to say enough about the job Nick Foles did over the last two weeks when the stakes were at their highest. He put passes on the money time and time again, using great protection from the guys up front to carve up a couple elite NFL teams. There was nothing flukey or lucky about what he accomplished at the helm over the last month, and he deserves a mountain of credit for rising to the occasion and keeping a team's Super Bowl dream alive. What a story it is for Foles, who by his own admission was close to retiring from football altogether. Unhappy and beaten down following a rough stint with the Rams, Foles returned back to the franchise that once made him a household name. Now, his name is cemented in Philadelphia forever, regardless of whether he ever plays another game here. This was the game of a lifetime from Foles, full stop, no qualifiers necessary. He stood tall in a shootout against the greatest quarterback in NFL history in a game where that opponent was at absolute peak performance. This was not lost on the people watching at home. • The use of each guy in specific situations can be frustrating at times, but you'd be hard-pressed to find a better way to split the reps between running backs than the Eagles did Sunday. Each member of the running back trio made his presence felt during the game, using limited touches to make themselves part of a historic offensive performance in the Super Bowl. Corey Clement? A dominant game catching the ball out of the backfield, and an unsung part of why Nick Foles had all day to throw. LeGarrette Blount? The bruiser who came up with several huge conversions, and a massive touchdown run in the first half. And we can't forget Jay Ajayi, who was a brilliant change of pace in small doses, even if Eagles fans might've liked to see him on the field a little more. For a group that came into the season with a ton of question marks, the Eagles' running backs were excellent when the games really mattered and a pivotal part of their success all year. • All of the above can be credited in part to the offensive line, who kept Foles upright for most of the game and allowed him to stand back and deal from the pocket. They opened up holes in the run game and showed a ton of versatility in how they got the job done. That they were able to shrug off the absence of big Jason Peters on the left side of the line for even a game, let alone for the rest of the season as they did, is a major accomplishment from this group. Halapoulivaati Vaitai went from the weakest link in the chain to a legitimate strength of the football team in the span of about half a season, which deserves to be highlighted after all the grief "Big V" has endured over the past couple years. • They were horrific all night, and did not play a caliber of defense worthy of winning a Super Bowl. But on the biggest drive on their football lives, the Eagles' defensive line came up with a turnover that ended the Patriots' night. On the one side: Brandon Graham, the guy who was killed for years for simply not being Earl Thomas. On the other, Derek Barnett, the first-round pick who was met with a lot of raised eyebrows when the Eagles first selected him. • How about the balls on rookie Jake Elliott? Faced with the biggest kick of his life with just over a minute to play, the rookie absolutely crushed one through the middle of the uprights. Nobody is going to remember that missed extra point now. • This win is about the way the Eagles played in the biggest game of their lives, but it’s about so much more than that. It’s about all the people, past and present, who built the foundation and the platform for a franchise to finally break through. It is about Malcolm Jenkins, a second option among fans when in free agency but a spiritual and physical leader for the franchise from the moment he arrived. It is about Fletcher Cox, the big money lineman, the pillar around which Philadelphia’s defensive line is built. It is about Nick Foles, the quarterback who many doubted could get the job done. It is about Jay Ajayi, discarded by his former team at midseason and given a chance to play for a team playing the best football in the league. It is about Jerome Brown, the gregarious, spirited lineman who tragically lost his life in a car accident in the early 1990’s, who would have turned 53 years old on Super Bowl Sunday. It is about Brian Dawkins, a leader on the field and off who gave everything for this organization but was never able to get over that final hump as a player. It is about all the fans back home in Philadelphia, those still with us and those who have passed, who show up for training camp and preseason year after year expecting their team to win the Super Bowl. Finally, their wishes and dreams have come to fruition, in a season where the Eagles had every excuse to lay down and die after their franchise quarterback went down with a knee injury. It is about everyone, from the GM who put together the team right down to the equipment guys who fill the Gatorade coolers. It is about the thousands of fans who unloaded their savings to fill a stadium in Minnesota and turn it into a home game away from home. It took every last person in Philadelphia to bring the Eagles to their first-ever Super Bowl title. We all we got, and we all we need. And now, we all get to celebrate. • Rob Gronkowski got almost nothing going in the first half, which was a massive win for the Eagles. Unfortunately for Philadelphia, that did not hold up to begin the second half and their star offensive player showed what a matchup nightmare he can be. Tom Brady missed him on the first play from scrimmage in the second half, but he just kept going and going to his big target, picking on poor Corey Graham matched up with him on the outside. It's a tough assignment for a top defensive player, let alone a guy reasonably low on the secondary depth chart. Jim Schwartz was happy to play single coverage on Gronkowski, and though you don't want to overload too much help on a guy it wasn't like the strategy they ended up going with was effective. New England punched the ball in with less than three minutes taken off the clock to start the half, killing most of the momentum Philly carried into halftime. • Part of the reason Gronk was able to get loose in the second half? The Eagles doing absolutely nothing to bother Brady in the pocket. They don't have the type of secondary that can overcome a poor pass rush, especially when you're playing against an elite, all-time great quarterback. If there was ever a time for the guys up front to have a big performance, it was in this game, and the area of their defense that has the most money invested in it simply could not get it done. This certainly cuts both ways, and Philadelphia's secondary didn't do a good enough job of stopping a Patriots skill group that is not exactly star-studded past Gronk. Their strength is their depth and trust from one guy to the next, but the Eagles are perfectly capable of deterring them on their best day. They did nothing of the sort in the biggest game of their lives. And look, there are worse people to have that sort of performance against than the Patriots because you tip your hat to Brady and Belichick on some level. But that's not an excuse for this sort of performance. The Eagles allowed the Patriots to create all sorts of new offensive records for the biggest game in football, and that's tremendously disappointing. There will be all sorts of questions asked about every guy involved in this performance, starting at the top with Jim Schwartz. The Eagles started sending a few light blitzes late in the game, but at that point, it was basically too late, and not enough of a change to disrupt Brady and Belichick's flow. • Yes, Mychal Kendricks held Rob Gronkowski on a play midway through the third quarter. It was not enough to send that massive man flying to the ground, and for a player lauded for being tough and gritty as he is he sure doesn't have any shame about a little acting. • Zach Ertz's touchdown should have been a cause for celebration the moment it happened. Instead, it took a lengthy review for the NFL's best officials to determine that an obvious catch and dive for the end zone was, in fact, a touchdown. Massive, massive play for Ertz and Foles in the biggest spot imaginable. It shouldn't be ruined by the dumbest rule imaginable.